Garcima Non-Stick "Blini" Pancake Pan, Made in Spain! Made in Spain with heavy gauge carbon steel, these classic European pancake pans have many other uses in the kitchen. Once seasoned they become non-stick and can also be used on direct heat outdoors. As with all high carbon cookware, these pans must be dried and oiled after use. Garcima is the recognised world leader in authentic Spanish manufactured Blini pans. These beautiful pans have been made in Valencia Spain for many centuries. 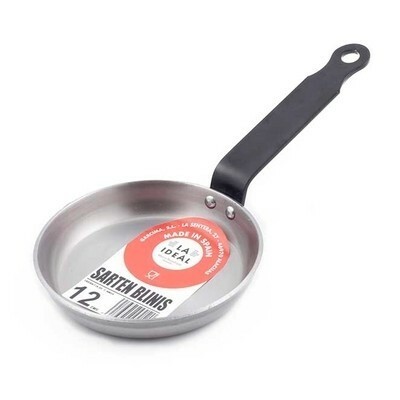 These authentic Blini pans are made of thin high carbon steel which are designed to respond very quickly to heat changes. They are extremely durable but need to be dried and oiled as described above. Being made from high carbon, these pans will rust if not dried immediately after washing and being lightly rubbed with vegetable oil prior to storage. 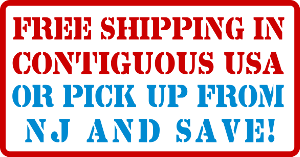 If rusting does occur it can be easily removed by an abrasive cleaner. All high carbon pans can be used on gas and electric cookers and can also be used on open flame and charcoal grills. Being slightly convex, paella pans are not great on flat ceramic cook tops, however remember you can also cook paella perfectly in your oven. Like all authentic paella pans, these do not have lids and should never be covered while cooking. Once off the heat, you may cover to retain temperature and moisture.